Detail of an 1827 map depicting a substantial part of southeastern Tennessee and northwestern Georgia as a confined territory assigned to the lower Creek and Cherokee nations. Cherokee removal, part of the Trail of Tears, refers to the forced relocation between 1836 and 1839 of the Cherokee Nation from their lands in Georgia, South Carolina, North Carolina, Tennessee, Texas, and Alabama to the Indian Territory (present day Oklahoma) in the then Western United States, and the resultant deaths along the way and at the end of the movement of an estimated 4,000 Cherokee. The Cherokee have come to call the event Nu na da ul tsun yi (the place where they cried); another term is Tlo va sa (our removal)—both phrases not used at the time, and seems to be of Choctaw origin. Removal actions (voluntary, reluctantly or forcibly) occurred to other American Indian groups in the American South, North, Midwest, Southwest, and the Plains regions. The Chickasaw, Choctaw, Creek and ( Muskogee) were removed reluctantly. The Seminole in Florida responded to removal by the United States Army for decades (1817–1850) with guerrilla warfare, part of the intermittent Native American Wars that lasted from 1540 to 1924. Some Seminole remained in their Florida home country, while others were transported to Native American Territory in shackles. John Ross estimated the value of Cherokee Land at $7.23 million. A conservative estimate by Matthew T. Gregg in 2009 puts Cherokee's land value for the 1838 market at $7,055,469.70, more than $2 million over the $5 million the senate agreed to pay. In this power vacuum, U.S. Agent John F. Schermerhorn gathered a group of dissident Cherokee in the home of Elias Boudinot at the tribal capital, New Echota, Georgia. There on December 29, 1835, this rump group signed the unauthorized Treaty of New Echota,  which exchanged Cherokee land in the East for lands west of the Mississippi River in Indian Territory. This agreement was never accepted by the elected tribal leadership or a majority of the Cherokee people. In February 1836, two councils convened at Red Clay, Tennessee and at Valley Town, North Carolina (now Murphy, North Carolina) and produced two lists totaling some 13,000 names written in the Sequoyah writing script of Cherokee opposed to the Treaty. The lists were dispatched to Washington, DC and presented by Chief Ross to Congress. Nevertheless, a slightly modified version of the treaty was ratified by the U.S. Senate by a single vote on May 23, 1836, and signed into law by President Jackson. The treaty provided a grace period until May 1838 for the tribe to voluntarily remove themselves to Indian Territory. Until widespread use of the cotton gin, short-staple cotton had been such an arduous crop to grow and process because of the time-consuming process of removing the sticky seeds from each of the individual boles of cotton. This process took so long that it was nearly unprofitable to grow cotton. The increased ease of cotton production due to access to the Cotton Gin, invented in 1793 by Eli Whitney, which used teeth to comb through the fluffy fibers and remove all of the seeds in a much more efficient manner, led to a major rise in the production of cotton in the south near North Carolina, Tennessee and Georgia. Production increased from 750,000 bales in 1830 to 2.85 million bales in 1850, earning the south the nickname King Cotton for its success. Matthew T. Gregg writes that "According to the 1835 Cherokee census enumerators, 1,707,900 acres in the Cherokee Nation in Georgia were tillable." This land was valuable farming land, with the ideal climate and the necessary 200 frost-free days for growing cotton, and would have been crucial in supporting the cotton industry's monumental growth, as would have increased ease of transportation due to railroads. The Cherokee Indians typically grew small family farms and only planted what was needed to survive alongside hunting and gathering. Some, however, heeded Silas Dinsmoor's advice. They took advantage of the growing demand for cotton and began to farm it themselves, asking for cotton cards, cotton gins, and spinning wheels from the United States Government. As immigration increased rapidly throughout the 1820s and 1830s, and by 1850 approximately 2.6 million people immigrated to the United States,  the government saw that the land could be used for more than just small family crops and could provide a source of income for the farmers immigrating to the south and needing farmable land. The Cherokees that did farm cotton in excess for selling became a threat to the settlers that were hoping to capitalize on the cotton industry by taking away not only valuable farm land but also adding more cotton to the market which could reduce the demand and the price, thus prompting the pursuit of a removal treaty. These tensions between Georgia's and the Cherokee Nation were brought to a crisis by the discovery of gold near Dahlonega, Georgia, in 1828, resulting in the Georgia Gold Rush, the first gold rush in U.S. history. Hopeful gold speculators began trespassing on Cherokee lands, and pressure began to mount on the Georgia government to fulfill the promises of the Compact of 1802. When Georgia moved to extend state laws over Cherokee tribal lands in 1830, the matter went to the U.S. Supreme Court. In Cherokee Nation v. Georgia (1831), the Marshall court ruled that the Cherokee were not a sovereign and independent nation, and therefore refused to hear the case. However, in Worcester v. State of Georgia (1832), the Court ruled that Georgia could not impose laws in Cherokee territory, since only the national government — not state governments — had authority in Indian affairs. The rapidly expanding population of the United States early in the 19th century created tensions with Native American tribes located within the borders of the various states. While state governments did not want independent Indian enclaves within state boundaries, Indian tribes did not want to relocate or to give up their distinct identities. With the Compact of 1802, the state of Georgia relinquished to the national government its western land claims (which became the states of Alabama and Mississippi). In exchange, the national government promised to eventually conduct treaties to relocate those Indian tribes living within Georgia, thus giving Georgia control of all land within its borders. However, the Cherokee, whose ancestral tribal lands overlapped the boundaries of Georgia, Tennessee, North Carolina, and Alabama, declined to move. They established a capital in 1825 at New Echota (near present-day Calhoun, Georgia). Furthermore, led by principal Chief John Ross and Major Ridge, the speaker of the Cherokee National Council, the Cherokee adopted a written constitution on 26 July 1827, declaring the Cherokee Nation to be a sovereign and independent nation. The Cherokee land that was lost proved to be extremely valuable. Upon these lands were the alignments for the future rights-of-way for rail and road communications between the eastern Piedmont slopes of the Appalachian Mountains, the Ohio River in Kentucky and the Tennessee River Valley at Chattanooga. This location is still a strategic economic asset and is the basis for the tremendous success of Atlanta, Georgia, as a regional transportation and logistics center. Georgia's appropriation of these lands from the Cherokee kept the wealth out of the hands of the Cherokee Nation. The Cherokee lands in Georgia were settled upon by the Cherokee for the simple reason that they were and still are the shortest and most easily traversed route between the only fresh water sourced settlement location at the southeastern tip of the Appalachian range (the Chattahoochee River), and the natural passes, ridges, and valleys which lead to the Tennessee River at what is today, Chattanooga. [ citation needed] From Chattanooga there was and is the potential for a year-round water transport to St. Louis and the west (via the Ohio and Mississippi rivers), or to as far east as Pittsburgh, PA.
Major Ridge, of the "Treaty Party". Illustration from History of the Indian Tribes of North America. With the landslide reelection of Andrew Jackson in 1832, some of the most strident Cherokee opponents of removal began to rethink their positions. Led by Major Ridge, his son John Ridge, and nephews Elias Boudinot and Stand Watie, they became known as the "Ridge Party", or the "Treaty Party". The Ridge Party believed that it was in the best interest of the Cherokee to get favorable terms from the U.S. government, before white squatters, state governments, and violence made matters worse. John Ridge began unauthorized talks with the Jackson administration in the late 1820s. Meanwhile, in anticipation of the Cherokee removal, the state of Georgia began holding lotteries in order to divide up the Cherokee tribal lands among white Georgians. However, Principal Chief John Ross and the majority of the Cherokee people remained adamantly opposed to removal. Political maneuvering began: Chief Ross canceled the tribal elections in 1832, the Council threatened to impeach the Ridges, and a prominent member of the Treaty Party (John Walker, Jr.) was murdered. The Ridges responded by eventually forming their own council, representing only a fraction of the Cherokee people. This split the Cherokee Nation into two factions: those following Ross, known as the National Party, and those of the Treaty Party, who elected William A. Hicks, who had briefly succeeded his brother Charles R. Hicks as Principal Chief of the Cherokee Nation to act as titular leader of the pro-Treaty faction, with former National Council clerk Alexander McCoy as his assistant. John Ross states in his letter to congress, "By the stipulations of this instrument, we are despoiled of our private possessions, the indefeasible property of individuals. We are stripped of every attribute of freedom and eligibility for legal self-defence. Our property may be plundered before our eyes; violence may be committed on our persons; even our lives may be taken away, and there is none to regard our complaints. We are denationalized; we are disfranchised. We are deprived of membership in the human family! We have neither land nor home, nor resting place that can be called our own. And this is effected by the provisions of a compact which assumes the venerated, the sacred appellation of treaty. We are overwhelmed! Our hearts are sickened, our utterance is paralyzed, when we reflect on the condition in which we are placed, by the audacious practices of unprincipled men, who have managed their stratagems with so much dexterity as to impose on the Government of the United States, in the face of our earnest, solemn, and reiterated protestations." In 1835, Jackson appointed Reverend John F. Schermerhorn as a treaty commissioner. The U.S. government proposed to pay the Cherokee Nation US$4.5 million (among other considerations) to remove themselves. These terms were rejected in October 1835 by the Cherokee Nation Council meeting at Red Clay. Chief Ross, attempting to bridge the gap between his administration and the Ridge Party, traveled to Washington with a party that included John Ridge and Stand Watie to open new negotiations, but they were turned away and told to deal with Schermerhorn. Meanwhile, Schermerhorn organized a meeting with the pro-removal council members at New Echota, Georgia. Only five hundred Cherokee (out of thousands) responded to the summons, and, on December 30, 1835, twenty-one proponents of Cherokee removal (Major Ridge, Elias Boudinot, James Foster, Testaesky, Charles Moore, George Chambers, Tahyeske, Archilla Smith, Andrew Ross (younger brother of Chief John Ross), William Lassley, Caetehee, Tegaheske, Robert Rogers, John Gunter, John A. Bell, Charles Foreman, William Rogers, George W. Adair, James Starr, and Jesse Halfbreed), signed or left "X" marks on the Treaty of New Echota after those present voted unanimously for its approval. John Ridge and Stand Watie signed the treaty when it was brought to Washington. Chief Ross, as expected, refused. This treaty gave up all the Cherokee land east of the Mississippi in return for five million dollars to be disbursed on a per capita basis, an additional half-million dollars for educational funds, title in perpetuity to an amount of land in Indian Territory equal to that given up, and full compensation for all property left in the East. There was also a clause in the treaty as signed allowing Cherokee who so desired to remain and become citizens of the states in which they resided on 160 acres (0.65 km2) of land, but that was later stricken out by President Jackson. 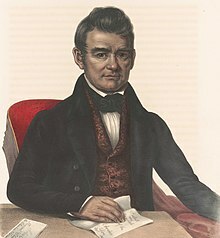 Despite the protests by the Cherokee National Council and principal Chief Ross that the document was a fraud, Congress ratified the treaty on May 23, 1836, by just one vote. John S. Young, Conductor; via river boats; 466 Cherokee and 6 Creek, left March 1, 1837; arrived March 28, 1837; included Major Ridge and Stand Watie. B.B. Cannon, Conductor; overland; 355 persons (15 deaths); left Oct.15, 1837; arrived Dec.29, 1837; included James Starr. Rev. John Huss, Conductor, overland; 74 persons; left Nov.11, 1837; arrival unknown. Robert B. Vann, leader; 133 persons; left Dec.1, 1837; arrived March 17, 1838. Lt. Edward Deas, Conductor; by boat; 252 persons (2 deaths); left April 6, 1838; arrived May 1, 1838. 162 persons; left May 25, 1838; arrived Oct. 21, 1838. 96 persons; date left unknown; arrived June 1, 1838. Lt. Edward Deas and John Adair Bell, Co-Conductors, overland, 660 persons left Oct. 11, 1838; 650 arrived Jan. 7, 1839. There are muster rolls for groups # 1, 3 – 6 and daily journals of conductors for groups # 2 and 5 among records of the Bureau of Indian Affairs in the National Archives. Despite the government blandishments, only a few hundred volunteered to accept the Treaty terms for Removal. Nevertheless, as the May 23, 1838, deadline for voluntary removal approached, President Van Buren assigned General Winfield Scott to head the forcible removal operation. He arrived at New Echota on May 17, 1838, in command of U.S. Army and state militia totalling about 7,000 soldiers. Scott discouraged mistreatment of the Native Americans, ordering his troops to "show every possible kindness to the Cherokee and to arrest any soldier who inflicted a wanton injury or insult on any Cherokee man, woman, or child." They began rounding up Cherokee in Georgia on May 26, 1838; ten days later, operations began in Tennessee, North Carolina, and Alabama. Men, women, and children were removed at gunpoint from their homes over three weeks and gathered together in concentration camps, often with very few of their possessions. About 1,000 Cherokee took refuge in the mountains to the east, and some who owned private property also escaped the evacuation. Private John G. Burnett later wrote "Future generations will read and condemn the act and I do hope posterity will remember that private soldiers like myself, and like the four Cherokee who were forced by General Scott to shoot an Indian Chief and his children, had to execute the orders of our superiors. We had no choice in the matter." Lt. Edward Deas, Conductor; 800 left June 6, 1838 by boat; 489 arrived June 19, 1838. Lt. Monroe, Conductor, 164 persons left June 12, 1838; arrival unknown. Lt. R.H.K. Whiteley, ca. 800 persons left June 13, 1838 by boat, arrived Aug. 5, 1838 (70 deaths). Captain Gustavus S. Drane, Conductor, 1072 left June 17, 1838 by boat, 635 arrived Sept. 7, 1838 (146 deaths, 2 births). Muster rolls for groups # 1 and 4 are in the records of the Bureau of Indian Affairs and # 2 in records of the Army Continental Commands (Eastern Division, Gen. Winfield Scott's papers) in the National Archives. There are daily journals of conductors for groups # 1 and 3 among Special Files of the Bureau of Indian Affairs. Fort Marr Blockhouse in Benton, Tennessee, is the last surviving remnant of the forts used to intern the Cherokee in preparation for their removal to Indian Territory. The deaths and desertions in the Army's boat detachments caused Gen Scott to suspend the Army's Removal efforts, and the remaining Cherokee were put into eleven internment camps, mostly located near Ross' Landing (now Chattanooga, TN) and at Red Clay, Bedwell Springs, Chatata, Mouse Creek, Rattlesnake Springs, Chestoee, and Calhoun (site of the former Cherokee Agency) located within Bradley County, TN and one camp (Fort Payne) in Alabama. Chief John Ross made sure to confirm and secure his position as leader of the removal process by conferring with other Cherokee leaders, who granted him full responsibility of this daunting task. He then wasted no time in forming a plan, in which he organized 12 wagon trains, each with about 1000 persons and conducted by veteran full-blood tribal leaders or educated mixed bloods. Each wagon train was assigned physicians, interpreters (to help the physicians), commissaries, managers, wagon masters, teamsters, and even grave diggers. Chief Ross also purchased the steamboat "Victoria" in which his own and tribal leaders' families could travel in some comfort. Lewis Ross, the Chief's brother, was the main contractor and furnished forage, rations, and clothing for the wagon trains. Although this arrangement was an improvement for all concerned, disease and exposure still took many lives. This is the part of the Removal usually identified as The "Trail of Tears." Daniel Colston, Conductor (first choice Hair Conrad became ill); Asst. Conductor Jefferson Nevins; 710 persons left Oct.5, 1838 from Agency camp and 654 people arrived at Woodall's place in Indian Territory on Jan. 4, 1839 (57 deaths, 9 births, 24 deserters). Elijah Hicks, Conductor; White Path (died near Hopkinsville, Kentucky) and William Arnold, Asst. Conductors; 809 persons left Oct.4, 1838 from Camp Ross on Gunstocker Creek and 744 people arrived Jan.4, 1839 at Mrs. Webber's place in Indian Territory. Rev. Jesse Bushyhead, Conductor; Roman Nose, Asst. Conductor; 864 left Oct. 16, 1838 from Chatata Creek camp and 898 arrived Feb. 27, 1839 at Fort Wayne, Ind. Ty. (38 deaths, 6 births, 151 deserters, 171 additions). Capt. John Benge, Conductor; George C. Lowrey, Jr. Asst. Conductor; 1,079 persons left Fort Payne camp, Alabama Oct. 1, 1838 and 1,132 arrived Jan.11, 1839 at Mrs. Webber's place, Indian Territory. (33 deaths, 3 births). Situake, Conductor; Rev. Evan Jones, Asst. Conductor; 1,205 persons left Oct. 19, 1838 from Savannah Creek camp and 1,033 arrived Feb. 2, 1839 (at Beatties' Prairie, Indian Territory. (71 deaths, 5 births). Capt. Old Fields, Conductor; Rev. Stephen Foreman, Asst. Conductor; 864 persons left Oct. 10, 1838 from Candy's Creek camp and 898 arrived Feb. 2, 1839 at Beatties' Prairie (57 deaths, 19 births, 10 deserters, 6 additions). Moses Daniel, Conductor; George Still, Sr. Asst. Conductor; 1,031 persons left from Agency camp on Oct.23, 1838 and 924 arrived March 2, 1839 at Mrs. Webber's (48 deaths, 6 births). Chuwaluka (a.k.a. Bark), Conductor; James D. Wofford (fired for drunkenness) and Thomas N. Clark, Jr. Asst. Conductors; 1,120 left Oct.27, 1838 from Mouse Creek camp and 970 arrived March 1, 1839 at Fort Wayne. Judge James Brown, Conductor; Lewis Hildebrand, Asst. Conductor; 745 left Oct. 31, 1838 from Ootewah Creek camp and 717 arrived March 3, 1839 at Park Hill. George Hicks, Conductor; Collins McDonald, Asst. Conductor; 1,031 left Nov. 4, 1838 from Mouse Creek camp and 1,039 arrived March 14, 1839 near Fort Wayne. Richard Taylor, Conductor; Walter Scott Adair, Asst. Conductor; 897 left Nov. 6, 1838 from Ooltewah Creek camp and 942 arrived March 24, 1839 at Woodall's place(55 deaths, 15 births). Missionary Rev. Daniel Butrick accompanied this detachment, and his daily journal has been published. Peter Hildebrand, Conductor; James Vann Hildebrand, Asst. Conductor; 1,449 left Nov. 8, 1838 Ocoe camp and 1,311 arrived March 25, 1839 near Woodall's place. "Victoria" Detachment – John Drew Conductor; John Golden Ross, Asst. Conductor; 219 left Nov. 5, 1838 Agency camp and 231 arrived March 18, 1839 Tahlequah. There exist muster rolls for four (Benge, Chuwaluka, G. Hicks, and Hildebrand) of the 12 wagon trains and payrolls of officials for all 13 detachments among the personal papers of Principal Chief John Ross in the Gilcrease Institution in Tulsa, OK. The number of people who died as a result of the Trail of Tears has been variously estimated. American doctor and missionary Elizur Butler, who made the journey with the Daniel Colston wagon train, estimated 2,000 deaths in the Army removal and internment camps and perhaps another 2,000 on the trail; his total of 4,000 deaths remains the most cited figure, although he acknowledged these were estimates without having seen government or tribal records. A scholarly demographic study in 1973 estimated 2,000 total deaths; another, in 1984, concluded that a total of 6,000 people died. The 4000 figure or one quarter of the tribe was also used by the Smithsonian anthropologist, James Mooney. Since 16,000 Cherokee were enumerated on the 1835 Census, and about 12,000 emigrated in 1838, ergo 4000 needed accounting for. Note that some 1500 Cherokee remained in North Carolina, many more in South Carolina, and Georgia, so the higher fatality numbers are unlikely. In addition, nearly 400 Creek or Muskogee Indians who had avoided being removed earlier, fled into the Cherokee Nation and became part of the latter's Removal. An accounting of the exact number of fatalities during the Removal is also related to discrepancies in expense accounts submitted by Chief John Ross after the Removal that the Army considered inflated and possibly fraudulent. Ross claimed rations for 1600 more Cherokee than were counted by an Army officer, Captain Page, at Ross' Landing as Cherokee groups left their homeland and another Army officer, Captain Stephenson, at Fort Gibson counted them as they arrived in Indian Territory. Ross' accounts are consistently higher numbers than that of the Army disbursing agents. The Van Buren administration refused to pay Ross, but the later Tyler administration eventually approved disbursing more than $500,000 to the Principal Chief in 1842. In addition, some Cherokee traveled from east to west more than once. Many deserters from the Army's boat detachments in June 1838 later emigrated in the twelve Ross wagon trains. There were transfers between groups, and later join ups and desertions were not always recorded. Jesse Mayfield was a white man with a Cherokee family went twice (first voluntarily in B.B. Cannon's detachment in 1837 to Indian Territory; unhappy there, he returned to the Cherokee Nation; and in Oct. 1838 was Wagon Master for the Bushyhead Detachment). An Army disbursing agent discovered that a Cherokee named Justis Fields travelled with government funds three times under different aliases. A mixed-blood named James Bigby, Jr. travelled to Indian Territory five times (three as government interpreter for different detachments, as Commissary for the Colston detachment, and as an individual in 1840). In addition, a small but significant number of mixed-bloods and whites with Cherokee families petitioned to become citizens of Alabama, Georgia, North Carolina, South Carolina, or Tennessee and thus ceased to be considered Cherokee. Trail of Tears marker, Hwy 71, Fayetteville, Arkansas. There were some exceptions to removal. Those Cherokee who lived on private, individually owned lands (rather than communally owned tribal land) were not subject to removal. In North Carolina, about 400 Cherokee led by Yonaguska lived on land along the Oconaluftee River in the Great Smoky Mountains owned by a white man named William Holland Thomas (who had been adopted by Cherokee as a boy), and were thus not subject to removal, and these were joined by a smaller band of about 150 along the Nantahala River led by Utsala. Along with a group living in Snowbird and another along the Cheoah River in a community called Tomotley, these North Carolina Cherokee became the Eastern Band of the Cherokee Nation, numbering approximately 1000. According to a roll taken the year after the removal (1839), there were in addition some estimated about 400 of Georgia, South Carolina, Tennessee, and Alabama, and these also joined the EBCI. The Trail of Tears is generally considered to be one of the most regrettable episodes in American history. To commemorate the event, the U.S. Congress designated the Trail of Tears National Historic Trail in 1987. It stretches across nine states for 2,200 miles (3,500 km). The group Paul Revere & the Raiders issued a single in the early 1970s which commemorated the forcible removal of the Cherokee Nation: " Indian Reservation (The Lament of the Cherokee Reservation Indian)". Country-rock super-group Southern Pacific recorded a song titled "Trail of Tears" on their 1988 Zuma album. In 1974 John and Terry Talbot Mason Proffit wrote and recorded their song "Trail of Tears" on the album The Talbot Brothers. Swedish rock band Europe refers to the Trail of Tears in their song " Cherokee" on their album The Final Countdown. Popular US composer James Barnes published a tone poem for wind band entitled Trail of Tears (1989) that depicts the journey made by the Cherokee people. The piece includes the recitation of a mournful poem in the Cherokee language: Dedeeshkawnk juniyohoosa, Dedeeshkawnk ahyoheest, Dedeeshkawnk daynahnohtee (Let us mourn those who have died, Let us mourn those who are dying, Let us mourn those who must endure). Guitarist Eric Johnson released a song entitled "Trail of Tears" on his 1986 album Tones. A Parchment of Leaves, a novel by Silas House, uses the Cherokee Removal as a major plot-point. The novel Through the Trail of Tears by Gloria V. Casañas has these events as a major theme in the story, told through excerpts of a fictional diary. ^ Len Green. "Choctaw Removal was really a "Trail of Tears"". Bishinik, mboucher, University of Minnesota. Archived from the original on 2008-06-04. Retrieved 2008-04-28. ^ Garrison, Tim (November 19, 2004). "Cherokee Removal". New Georgia Encyclopedia. Retrieved October 10, 2014. ^ a b Gregg, Matthews T (2009). "Uncovering the Value of Pre-Removal Cherokee Property". The Chronicles of Oklahoma. ^ "Treaty of New Echota". Retrieved December 26, 2016. ^ Dwyer, John (2013). Trail of Tears and Blessings. American Opinion Publishing Inc.
^ "Cotton in the south". Cotton in the South. Retrieved October 11, 2014. ^ Pierson, Parke. "Seeds of conflict: tiny cotton seeds had a lot to do with bringing on a big war." America's Civil War Sept. 2009: 25. Academic OneFile. Web. 12 Oct. 2014. ^ Gregg, Matthew T (2009). "Uncovering the Value of Pre-Removal Cherokee Property". The Chronicles of Oklahoma: 330. ^ "Cherokee before 1800". Aboutnorthgeorgia.com. Retrieved October 12, 2014. ^ Aboukhadijeh, Feross (November 17, 2012). "A Growing National Economy". Study Notes.org. Study Notes Inc. Retrieved October 11, 2014. ^ "The Cherokees and "A Century of Dishonor"" (33). The Independent... Devoted to the Consideration of Politics, Social and Economic Tendencies, History, Literature, and the Arts. February 24, 1881. ^ Anderson, William (1991). Cherokee Removal: Before and After. Athens, Georgia: University of Georgia Press. ISBN 978-0820312545. ^ "History.com". History.com. A&E Television Networks. 2014. Retrieved 2014-10-27. ^ a b c Jones, Billy (1984). Cherokees: An Illustrated History. Muskogee, Oklahoma: The Five Civilized Tribes Museum. pp. 74–81. ISBN 978-0-86546-059-1. ^ Letter to President Van Buren Archived May 24, 2008, at the Wayback Machine, Ralph Waldo Emerson, April 23, 1838. ^ a b Rozema, Vicki (1995). Footsteps of the Cherokee. Winston-Salem, North Carolina: John F. Blair. p. 52. ISBN 978-0-89587-133-6. ^ a b Weiser, Kathy (April 2013). "Cherokee Trail of Tears". Legends of America. Archived from the original on 2014-10-22. Retrieved 2014-10-16. ^ Prucha, Great Father, p. 241 note 58; Ehle, Trail of Tears, pp. 390–92; Russel Thornton, "Demography of the Trail of Tears" in Anderson, Trail of Tears, pp. 75–93. ^ "Top 25 American Indian Tribes for the United States: 1990 and 1980". U.S. Bureau of the Census. August 1995. Archived from the original on 2011-11-26. Retrieved 2017-12-07. ^ Melissa Block (host) (June 13, 2008). "Apology to American Indians Moves Forward". All Things Considered. NPR. Retrieved 2011-10-02. A resolution making its way through Congress offers an apology to all Native peoples on behalf of the United States. It passed the Senate as an amendment to the Indian Health Care Improvement Act. ^ Keesee, Kellie (2014-01-16). "Cherokee seed project sows respect for the past, hope for the future". Eatocracy - CNN.com Blogs. Archived from the original on 2014-01-19. Retrieved 2014-01-19. Carter, Samuel. Cherokee Sunset: A Nation Betrayed. New York: Doubleday, 1976. Denson, Andrew. Monuments to Absence: Cherokee Removal and the Contest over Southern Memory. Chapel Hill, NC: University of North Carolina Press, 2017. King, Duane and Fitzgerald, David G., The Cherokee Trail of Tears, Graphic Arts Center Publishing Company, Portland, OR, 2007. ISBN 1-55868-905-2.